Sip the broth. Savor the meat, fish, and vegetables. Indulge in the noodles. Ramen is a delicious way to fill up your belly. And Maine is home to a variety of mouthwatering options. From Kittery to Portland, here are the 10 best ramen places in the state. The ramen, the service, and the atmosphere all compete for the number one spot in your visit to Anju Noodle Bar. A small restaurant in an old refurbished building, this is by far the best place for ramen in southern Maine. The Shio Paitan Ramen is flavorful and filling. Made with bone broth, it features sun noodles, chashu pork, woodear mushrooms, black garlic oil, scallions and an entire ajitima soy egg. Mi Sen touts itself as a noodle bar, and what better place is there to indulge in a delicious bowl of ramen? Choose your noodles and additional ingredients or ask your server for suggestions. Order your ramen straight from the menu to enjoy a signature dish. Any way you order it, you’ll love the ramen here. Build your own ramen bowl at Umami Noodle Bar in Bangor. 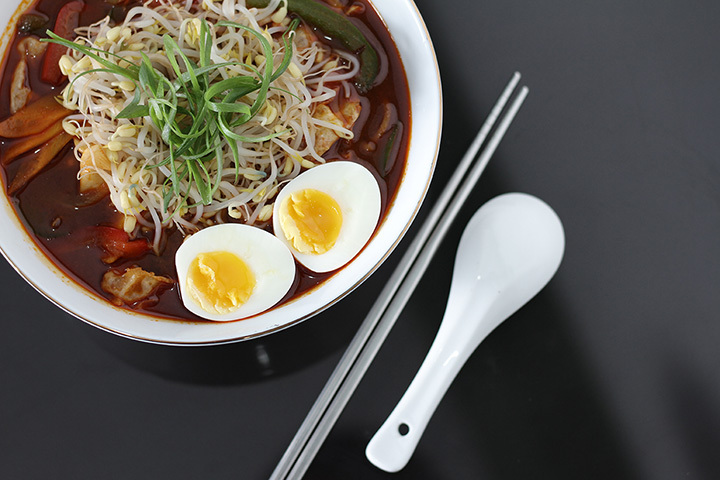 The spicy Thai broth is a favorite, as it offsets some of the more delicate flavors of the add-ins. The staff is always happy to make suggestions on delicious combinations, too. The Hakata-Style Ramen at Ramen Suzukiya will warm your heart and soul—and do a nice job of taking the coastal Maine chill out of your bones. The chicken soup broth combined with organic thin noodles, cha-su, a soft-boiled egg and bok choy actually make for a creamy pork flavor. This trendy restaurant is a favorite in the Portland area, so don’t be surprised if you walk in to a wait. The House Ramen at Little Tokyo Restaurant will satisfy any ramen cravings you’re having. Made up of chicken, seafood, shitake mushrooms and more, it comes together in a light broth. To make the meal even heartier, it’s served with a tempura shrimp on the side. Reservations are accepted, and if you’re dining here on the weekend, they’re actually recommended. They’re only available for parties of four or more, so round up a few friends before you go. The rustic atmosphere at Pai Men Miyake is as comfortable as their ramen makes you feel. The restaurant’s name means “100 noodles,” and when combined with the rich, flavorful broths, results in ramen that’s hard to beat. They don’t take reservations, so if you want to eat there on a weekend, avoid peak hours. Don’t let the “typical” vibe of Yoshi Japanese Restaurant prevent you from checking out their delicious ramen. You’re not there for the décor! The roasted pork ramen is satisfying and savory—loaded with bamboo shoots, scallions and noodles in a soy sauce-based broth. Dine in or take it to go. They even deliver. Camden might be a sleepy town in the winter, but Long Grain will wake you up with their exceptional ramen. The combination of duck, noodles, a free-range egg stained with soy, pickled shitake and more in a dark soy broth is a savory sensation. It’s so hearty that not everyone can finish it. Winter is the perfect time to eat at Long Grain, as you don’t have to battle the summer crowds. You’ll find hot, tempting ramen at Aki in Brunswick. Cha Siu Ramen and Kimchi Ramen are popular options among their customers. The nondescript exterior might urge you to walk right by, but you’ll be treated to exceptional service and delicious ramen if you stop in. The ramen at Sapporo keeps a steady flow of customers stopping in for both lunch and dinner. Choose from pork, fish, veggies and more. Add in bamboo shoots, spinach and a delicately flavored broth for the perfect meal.